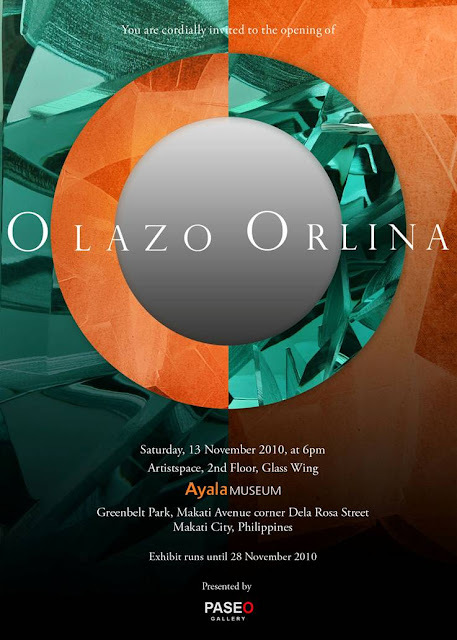 “Olazo Orlina”, the two-man exhibition of Romulo G. Olazo and Ramon G. Orlina, will be presented at the Artistspace in the Glass Wing of the Ayala Museum on November 13. 2010. The show is organized by Paseo Gallery. Both artists have in common an obsession with light. Olazo is well-known for his long-running “Diaphanous” series while Orlina pioneered the medium of glass sculpture. The show is among the year’s most-awaited art events. “Olazo/Orlina” will run till November 28, 2010. The Ayala Museum is located at Makati Avenue, cor. F. dela Rosa, Makati City. For inquiries, call Elena Perez or Inah Gacusan. Tel. (632) 7280168.